Stone Countertops – Do You Know the Difference? 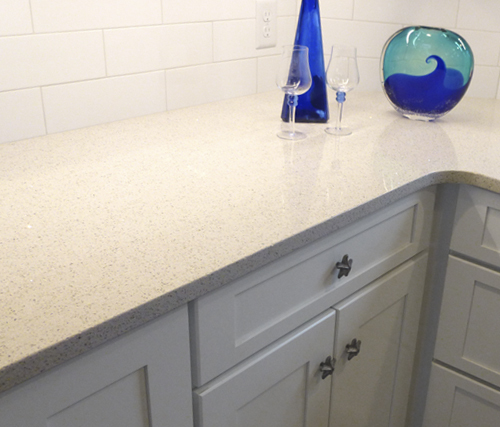 It’s a common misconception that applying sealer to a stone countertop is all that’s needed to protect it from damage. Unfortunately, even after sealer is applied, stone is susceptible to scratches, staining, chipping and heat damage. Knowing the compositional qualities of each stone is the best way to choose a countertop that can handle the wear and tear of a busy kitchen or bathroom. Profile: Quartz boats a very high resistance to stains and scratches, as well as a low absorption rate of liquids. 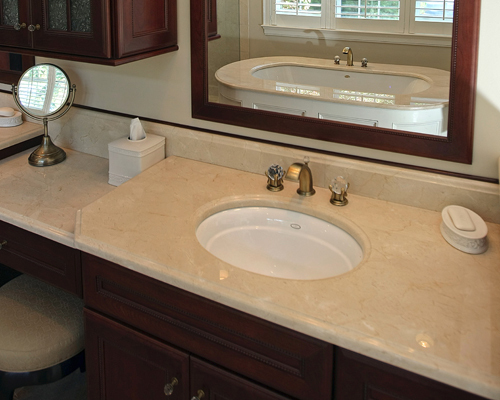 Surface Notes: Quartz is a low maintenance stone that can be cleaned with any mild household cleaner. Finishes: Polished. Honed available in some colors. 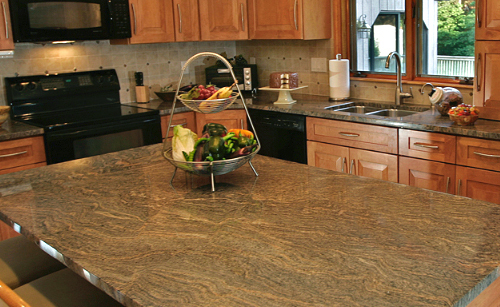 Profile: Granite is one of the hardest stones and is virtually scratch resistant. A low porosity and a very high heat resistance make it popular countertop material for active kitchens. Surface Notes: Granite is less porous than other stone but still needs to be sealed to reduce it’s porosity. If you’re sealing granite with an impregnating sealer, be sure to do it every six months. If the slab was sealed professionally by the manufacturer, it might not require resealing for up to five years. Finishes: Honed, polished, sandblasted or brushed. 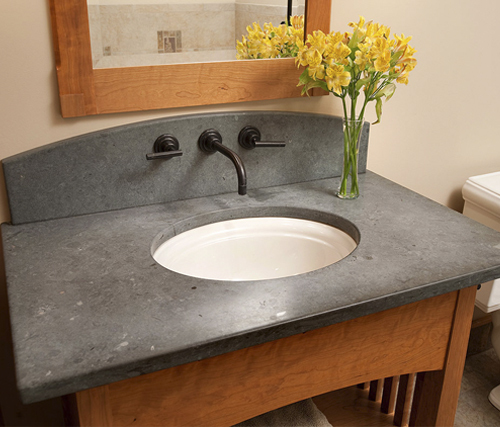 Profile: Soapstone is dense and soft, and it is the least-porous stone countertop material available. It is often used in science laboratories that demand clean, sterile environments, which isn’t much different than the demands of a kitchen. Surface Notes: Because soapstone is impenetrable, it is resistant to stains, bacteria growth, and damage from acidic substances. 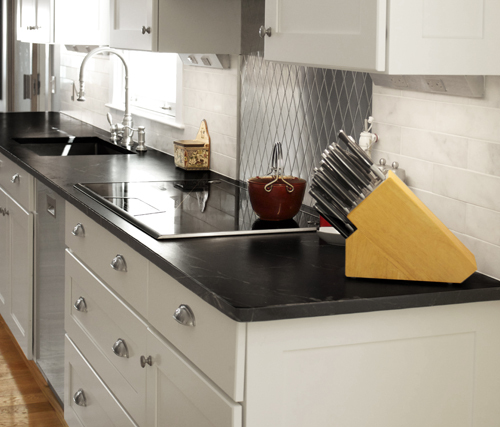 Soapstone comes in three colors: gray, green and black. Similar to slate, soapstone’s color might not be fully realized until a weekly application of mineral oil had taken place for nearly a year. Profile: Marble is a very soft stone, so it cannot withstand high heat, and it is easily etched by acidic substances such as orange juice. Surface Notes: Marble is known for it’s natural ability to stay cool and is often preferred by professional chefs for rolling dough and making pastries. The patina of polished or aged marble is prized for its traditional, old-world appeal. When selecting marble counters, remember that a polished finish makes surface imperfections more noticeable, whereas a honed or brushed finish helps to mask any scratches. Finishes: Polished, honed or brushed. Profile: High-quality, dense slate is less absorbent and more durable than many countertop materials, so it doesn’t require sealing like other types or stone countertops. Surface Notes: Due to it’s low porosity, slate is less likely to harbor bacteria. However, its uneven surface makes slate counters difficult to clean. Slate should be periodically treated with mineral oil to reduce it’s chalky appearance and to enhance its color tone. Finishes: Honed, polished or cleft.